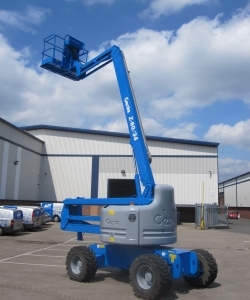 Articulating boom lifts available with a range of working heights and outreach suitable for all applications. Large stocks normally available, scroll down to see the machines available now. All used articulating boom lifts are LOLER certified with full history. Available now for fast delivery, UK-wide. 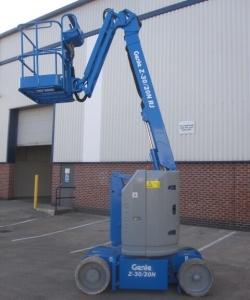 Year 2011 Genie Z30/20N RJ, only 1.19m wide but with a very impressive working envelope. 6 month LOLER certificate and 6 month warranty. Tight for space and think you cannot use a boom, think again and take a look at the Genie Z30. Comes with 6 month warranty & full re-spray. Perfect for working inside when space is tight but a good horizontal reach is required. Supplied by UK Genie Dealer Workplatform with a 6 month warranty and new LOLER cert. Fantastic machine for those tight and hard to get at areas. Supplied with a new 6-month LOLER certificate and 6-month warranty. Tight for space and working internally, then Genie's popular Z30/20N RJ may be the answer to reach those hard to get at areas. 1.19m wide Z30, exceptional working envelope and only done 365 hrs. Supplied with a new 6 month LOLER certificate and 6 month warranty. 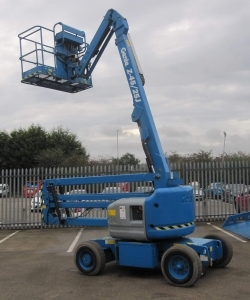 10.89m working height & only 1.19m wide, ideal for industrial units, general maintenance & repairs. Fully serviced and with 6 month LOLER and warranty. Only 1.19m wide but has a working height of 10.89m. Non marking tyres, zero tailswing and rotating jib are all standard. 6month warranty LOLER. Supplied re-sprayed, serviced and tested with a new LOLER cert and 6 month warranty. 476 hours on the clock. 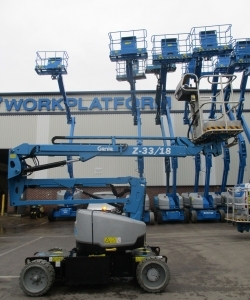 Used 2015 Genie Z33/18 electric boom lift with 221 hours on the clock. Supplied with 6 month LOLER and 6 month warranty. Whether you need to drive through standard doorways, around obstacles or to access overhead work from aisles, it’s all possible with the compact Genie Z33/18 electric boom lift. 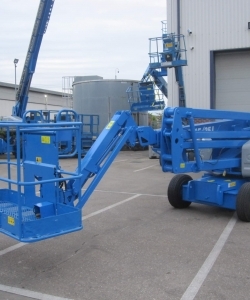 This used 2008 Niftylift HR12N has a working height of 12.2m. With a 1.5 m narrow chassis, the HR12N is ideal for working in factories, warehouses or anywhere that space is restricted. 1.22m articulating jib with a 139° vertical rotation to accurately position workers whilst having a compact chassis for narrow aisle access. Fully serviced and with a 6 month warranty. Combines quiet, emission-free, operation of a 48v DC machine with the versatility of a diesel-powered gen. for both indoor & outdoor use. Fully serviced and with a 6 month warranty. This model can either run on the diesel engine or on the batteries. Supplied with new 6 month LOLER and 6 month warranty. With only 483 hours on the clock this very clean Bi Energy boom is supplied fully serviced, with a new 6 month LOLER and 6 month warranty. Only 498 hours on the clock this clean Z45 that can run either on batteries or the engine would be supplied serviced and with a 6 month warranty. 592hours on the clock. Fully re-sprayed, serviced and tested. New 6 month LOLER and 6-month warranty. 2013 Bi-Energy with Jib self-propelled articulating boom. Indoor/outdoor use. Resprayed, serviced, LOLER & warranty. This Genie Z45 can either operate on the engine or on the batteries. Supplied fully serviced and with a new 6 month LOLER cert. and 6 month warranty. Virtually no noise with this battery powered 15.94m working height boom. Supplied fully serviced, new 6 month LOLER and 6 month warranty. YOM 2006 with 3701 hours. Fully re-sprayed serviced & tested with 6-month warranty & new 6-month LOLER. Used 4WD diesel powered, articulating boom with 16.07 m working height. Fully serviced with 6 month LOLER certificate and 6 month warranty. The Genie Z45RT is the worlds best selling articulated boom and this unit from Genie Dealer Workplatform is supplied with a 6 month warranty. 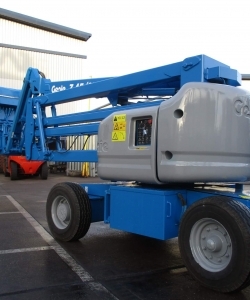 16m Genie articulating diesel boom with 4WD drive fully serviced and tested. Suitable for rough terrain applications. Diesel-powered 4 x 4 articulating boom, supplied fully serviced, re-sprayed with a new LOLER cert & 6-month warranty. 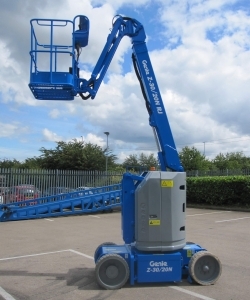 Ever popular Genie Z45 diesel boom. Supplied fully serviced, tested, inspected, with new LOLER cert. & 6 month warranty. Fully re-sprayed, serviced and tested with 6 month warranty & new 6 month LOLER certificate. 2007 YOM, 3269 hrs. Z45 diesel powered boom, 4WD. Fully re-sprayed, serviced and with new LOLER cert and 6 month warranty. Diesel boom, suitable for construction and rough terrain applications. Supplied serviced and with a new 6 month LOLER and 6 month warranty. The worlds best selling boom is a Genie Z45, this one is supplied fully re-sprayed with a new LOLER cert and 6 month warranty. Genie Z45 self propelled articulating diesel boom. Supplied fully serviced, with a new 6 month LOLER certificate and 6 month warranty. Used Z51/30J RT 4x4, 2006. Outdoor machine, 45% gradeability. Supplied with 6-month LOLER & Warranty. 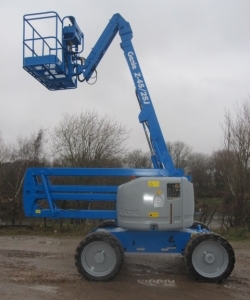 This Genie Z60/34 4WD with rough terrain tyres makes work on construction sites easy. Supplied with 6 month LOLER and 6 month warranty. 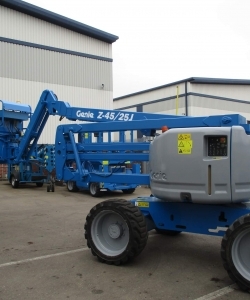 Used 2008 Genie Z60/34 4WD with 2802 hours on the clock. Supplied with 6 month LOLER certificate and 6 month warranty. The Z60/34 4WD is perfect for demanding construction and industrial work with a 20m working height and 8.2m up and over clearance. The Z80/60 has a 25.77m working height and is well known for its exceptional up and over clearance and horizontal reach. Supplied with 6 month warranty.